This is “Corporate Powers and Management”, chapter 16 from the book The Law, Corporate Finance, and Management (v. 1.0). For details on it (including licensing), click here. Power within a corporation is present in many areas. The corporation itself has powers, although with limitations. There is a division of power between shareholders, directors, and officers. Given this division of power, certain duties are owed amongst the parties. We focus this chapter upon these powers and upon the duties owed by shareholders, directors, and officers. In Chapter 17 "Securities Regulation", we will continue discussion of officers’ and directors’ liability within the context of securities regulation and insider trading. The one-share, one-vote principle, commonly called regular votingThe principle of one share, one vote. Also called statutory voting. or statutory voting, is not required, and many US companies have restructured their voting rights in an effort to repel corporate raiders. For instance, a company might decide to issue both voting and nonvoting shares (as we discussed in Chapter 16 "Corporate Powers and Management"), with the voting shares going to insiders who thereby control the corporation. In response to these new corporate structures, the Securities and Exchange Commission (SEC) adopted a one-share, one-vote rule in 1988 that was designed to protect a shareholder’s right to vote. In 1990, however, a federal appeals court overturned the SEC rule on the grounds that voting rights are governed by state law rather than by federal law.Business Roundtable v. SEC, 905 F.2d 406 (D.C. Cir. 1990). While derivative actions are subject to abuse by plaintiffs’ attorneys seeking settlements that pay their fees, safeguards have been built into the law. At least ninety days before starting a derivative action, for instance, shareholders must demand in writing that the corporation take action. Shareholders may not commence derivative actions unless they were shareholders at the time of the wrongful act. Derivative actions may be dismissed if disinterested directors decide that the proceeding is not in the best interests of the corporation. (A disinterested directorA director who has no interest in the disputed transaction. is a director who has no interest in the disputed transaction.) Derivative actions are discussed further in Chapter 16 "Corporate Powers and Management". The directors often delegate to officers the day-to-day authority to execute the policies established by the board and to manage the firm (see Figure 16.2 "The Corporate Governance Model"). Normally, the president is the chief executive officer (CEO) to whom all other officers and employees report, but sometimes the CEO is also the chairman of the board. Two main fiduciary duties apply to both directors and officers: one is a duty of loyalty, the other the duty of care. These duties arise from responsibilities placed upon directors and officers because of their positions within the corporation. The requirements under these duties have been refined over time. Courts and legislatures have both narrowed the duties by defining what is or is not a breach of each duty and have also expanded their scope. Courts have further refined the duties, such as laying out tests such as in the Caremark case, outlined in Section 16.4.3 "Duty of Care". Additionally, other duties have been developed, such as the duties of good faith and candor. As a fiduciary of the corporation, the director owes his primary loyalty to the corporation and its stockholders, as do the officers and majority shareholders. This responsibility is called the duty of loyaltyFiduciary obligation requiring loyalty of directors and officers to the corporation and its shareholders.. When there is a conflict between a director’s personal interest and the interest of the corporation, he is legally bound to put the corporation’s interest above his own. This duty was mentioned in Exercise 3 of Section 16.2 "Rights of Shareholders" when Ted usurped a corporate opportunity and will be discussed later in this section. 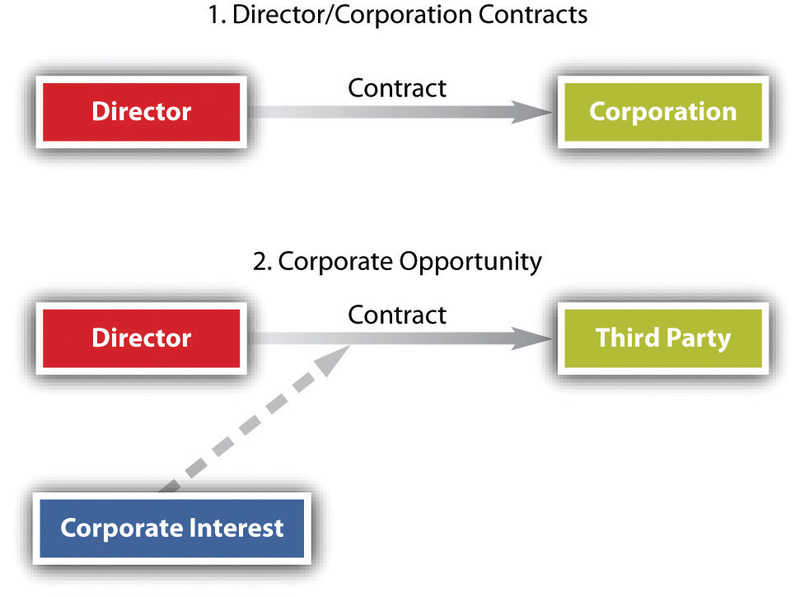 Two situations commonly give rise to the director or officer’s duty of loyalty: (1) contracts with the corporation and (2) corporate opportunity (see Figure 16.3 "Common Conflict Situations"). Despite the fiduciary requirements, in reality a director does not spend all his time on corporate affairs, is not omnipotent, and must be permitted to rely on the word of others. Nor can directors be infallible in making decisions. Managers work in a business environment, in which risk is a substantial factor. No decision, no matter how rigorously debated, is guaranteed. Accordingly, courts will not second-guess decisions made on the basis of good-faith judgment and due care. This is the business judgment rulePresumption given by the courts to corporate directors that their actions were informed and done with good faith and with an honest belief that the actions were in the best interests of the corporation., mentioned in previous chapters. The business judgment rule was coming into prominence as early as 1919 in Dodge v. Ford, discussed in Chapter 15 "Legal Aspects of Corporate Finance". It has been a pillar of corporate law ever since. As described by the Delaware Supreme Court: “The business judgment rule is an acknowledgment of the managerial prerogatives of Delaware directors.…It is a presumption that in making a business decision the directors of a corporation acted on an informed basis, in good faith and in the honest belief that the action taken was in the best interests of the company.”Aronson v. Lewis, 473 A.2d 805, 812 (Del. 1984). If a shareholder is not pleased by a director’s decision, that shareholder may file a derivative suit. The derivative suit may be filed by a shareholder on behalf of the corporation against directors or officers of the corporation, alleging breach of their fiduciary obligations. However, a shareholder, as a prerequisite to filing a derivative action, must first demand that the board of directors take action, as the actual party in interest is the corporation, not the shareholder (meaning that if the shareholder is victorious in the lawsuit, it is actually the corporation that “wins”). If the board refuses, is its decision protected by the business judgment rule? The general rule is that the board may refuse to file a derivative suit and will be protected by the business judgment rule. And even when a derivative suit is filed, directors can be protected by the business judgment rule for decisions even the judge considers to have been poorly made. See In re The Walt Disney Co. Derivative Litigation, (see Section 16.5.2 "Business Judgment Rule"). Whether or not they have the power to indemnify, corporations may purchase liability insurance for directors, officers, and employees (for directors and officers, the insurance is commonly referred to as D&O insurance). But insurance policies do not cover every act. Most exclude “willful negligence” and criminal conduct in which intent is a necessary element of proof. Furthermore, the cost of liability insurance has increased dramatically in recent years, causing some companies to cancel their coverage. This, in turn, jeopardizes the recent movement toward outside directors because many directors might prefer to leave or decline to serve on boards that have inadequate liability coverage. As a result, most states have enacted legislation that allows a corporation, through a charter amendment approved by shareholders, to limit the personal liability of its outside directors for failing to exercise due care. In 1990, Section 2.02 of the RMBCA was amended to provide that the articles of incorporation may include “a provision eliminating or limiting the liability of a director to the corporation or its shareholders for money damages.…” This section includes certain exceptions; for example, the articles may not limit liability for intentional violations of criminal law. Delaware Code Section 102(b)(7), as mentioned previously, was enacted after Smith v. Van Gorkom (discussed in Section 16.4.3 "Duty of Care") and was prompted by an outcry about the court’s decision. As a result, many corporations now use similar provisions to limit director liability. For example, Delaware and California permit the limitation or abolition of liability for director’s breach of the duty of care except in instances of fraud, bad faith, or willful misconduct. A corporation may exercise two types of powers: (1) express powers, set forth by statute and in the articles of incorporation, and (2) implied powers, necessary to carry out its stated purpose. The corporation may always amend the articles of incorporation to change its purposes. Nevertheless, shareholders may enjoin their corporation from acting ultra vires, as may the state attorney general. However, an individual stockholder, director, or officer (except in rare instances under certain regulatory statutes) may not be held vicariously liable if he did not participate in the crime or tort. Because ownership and control are separated in the modern publicly held corporation, shareholders generally do not make business decisions. Shareholders who own voting stock do retain the power to elect directors, amend the bylaws, ratify or reject certain corporate actions, and vote on certain extraordinary matters, such as whether to amend the articles of incorporation, merge, or liquidate. In voting for directors, various voting methodologies may be used, such as cumulative voting, which provides safeguards against removal of minority-shareholder-supported directors. Shareholders may use several voting arrangements that concentrate power, including proxies, voting agreements, and voting trusts. Proxies are regulated under rules promulgated by the Securities and Exchange Commission (SEC). Corporations may deny preemptive rights—the rights of shareholders to prevent dilution of their percentage of ownership—by so stating in the articles of incorporation. Some states say that in the absence of such a provision, shareholders do have preemptive rights; others say that there are no preemptive rights unless the articles specifically include them. Directors have the ultimate authority to run the corporation and are fiduciaries of the firm. In large corporations, directors delegate day-to-day management to salaried officers, whom they may fire, in most states, without cause. The full board of directors may, by majority, vote to delegate its authority to committees. Directors owe the company a duty of loyalty and of care. A contract between a director and the company is voidable unless fair to the corporation or unless all details have been disclosed and the disinterested directors or shareholders have approved. Any director or officer is obligated to inform fellow directors of any corporate opportunity that affects the company and may not act personally on it unless he has received approval. The duty of care is the obligation to act “with the care an ordinarily prudent person in a like position would exercise under similar circumstances.” Other fiduciary duties have also been recognized, and constituency statutes permit the corporation to consider factors other than shareholders in making decisions. Shareholders may file derivative suits alleging breaches of fiduciary responsibilities. The duties have been expanded. For example, when the corporation is being sold, the directors have a duty to maximize shareholder value. Duties of oversight, good faith, and candor have been applied. The corporation may agree, although not in every situation, to indemnify officers, directors, and employees for litigation expenses when they are made party to suits involving the corporation. The corporation may purchase insurance against legal expenses of directors and officers, but the policies do not cover acts of willful negligence and criminal conduct in which intent is a necessary element of proof. Additionally, the business judgment rule may operate to protect the decisions of the board. The general rule is to maximize shareholder value, but over time, corporations have been permitted to consider other factors in decision making. Constituency statutes, for example, allow the board to consider factors other than maximizing shareholder value. Corporate social responsibility has increased, as firms consider things such as environmental impact and consumer perception in making decisions. First Corporation, a Massachusetts company, decides to expend $100,000 to publicize its support of a candidate in an upcoming presidential election. A Massachusetts statute forbids corporate expenditures for the purpose of influencing the vote in elections. Chauncey, a shareholder in First Corporation, feels that the company should support a different presidential candidate and files suit to stop the company’s publicizing efforts. What is the result? Why? Assume in Exercise 1 that Chauncey is both an officer and a director of First Corporation. At a duly called meeting of the board, the directors decide to dismiss Chauncey as an officer and a director. If they had no cause for this action, is the dismissal valid? Why? A book publisher that specializes in children’s books has decided to publish pornographic literature for adults. Amanda, a shareholder in the company, has been active for years in an antipornography campaign. When she demands access to the publisher’s books and records, the company refuses. She files suit. What arguments should Amanda raise in the litigation? Why? A minority shareholder brought suit against the Chicago Cubs, a Delaware corporation, and their directors on the grounds that the directors were negligent in failing to install lights in Wrigley Field. The shareholder specifically alleged that the majority owner, Philip Wrigley, failed to exercise good faith in that he personally believed that baseball was a daytime sport and felt that night games would cause the surrounding neighborhood to deteriorate. The shareholder accused Wrigley and the other directors of not acting in the best financial interests of the corporation. What counterarguments should the directors assert? Who will win? Why? The CEO of First Bank, without prior notice to the board, announced a merger proposal during a two-hour meeting of the directors. Under the proposal, the bank was to be sold to an acquirer at $55 per share. (At the time, the stock traded at $38 per share.) After the CEO discussed the proposal for twenty minutes, with no documentation to support the adequacy of the price, the board voted in favor of the proposal. Although senior management strongly opposed the proposal, it was eventually approved by the stockholders, with 70 percent in favor and 7 percent opposed. A group of stockholders later filed a class action, claiming that the directors were personally liable for the amount by which the fair value of the shares exceeded $55—an amount allegedly in excess of $100 million. Are the directors personally liable? Why or why not?